The president repeats that he's 'under audit' and so won't turn over his returns, but the IRS says there's no rule preventing it. 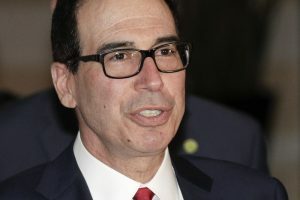 WASHINGTON — Treasury Secretary Steven Mnuchin said his department will be unable to deliver President Trump’s tax returns to Congress by the end of the day Wednesday, as had been requested. Mnuchin said he would continue to review the request. Trump said earlier Wednesday that he “won’t do it” while he’s under audit by the IRS. Trump has repeatedly asked aides as to the status of the House request, and has inquired about the “loyalty” of the top officials at the IRS, according to one outside adviser who requested anonymity to discuss private conversations. Mnuchin, who supervises the IRS, said Tuesday that he’s not seeking direction from the White House on whether to comply. Democrats didn’t expect the department to comply, but they haven’t sketched out their next steps.